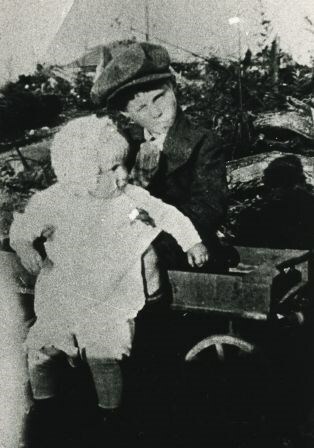 Photograph of two children outside of 2224 Antrim Avenue (later renumbered 6957 Antrim Avenue). 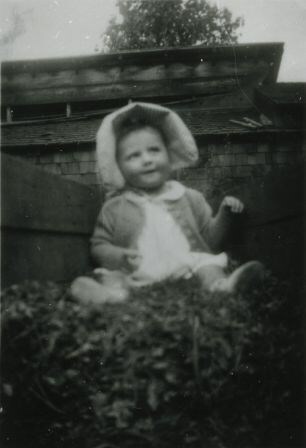 Photograph of a child outside of 2224 Antrim Avenue (later renumbered 6957 Antrim Avenue). 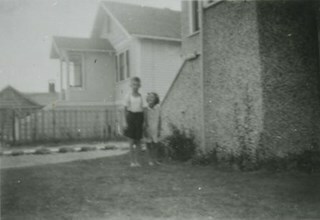 Photograph of two children in the front yard of 2224 Antrim Avenue (later renumbered 6957 Antrim Avenue). 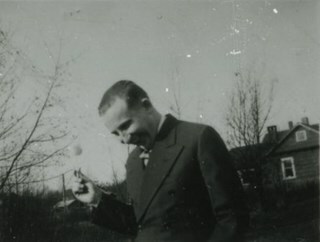 Photograph of Lyle Le Grove outside of 2224 Antrim Avenue (later renumbered 6957 Antrim Avenue). 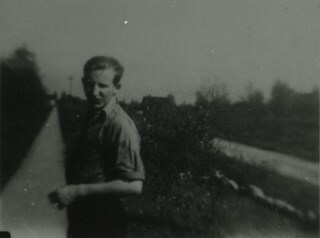 Photograph of Lyle Le Grove at 2224 Antrim Avenue (later renumbered 6957 Antrim Avenue). Photograph of the side of the house at 2224 Antrim Avenue (later renumbered 6957 Antrim Avenue). 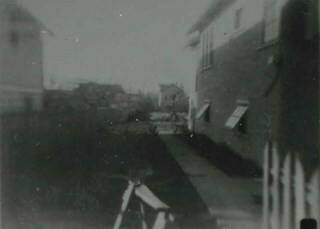 Photograph of the backyard of 2224 Antrim Avenue (later renumbered 6957 Antrim Avenue). 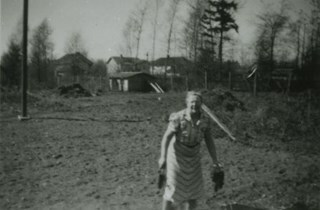 A woman is standing in the yard. 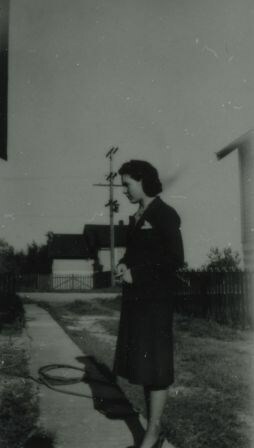 Photograph of Evelyn Le Grove standing on a sidewalk outside of 2224 Antrim Avenue (later renumbered 6957 Antrim Avenue). 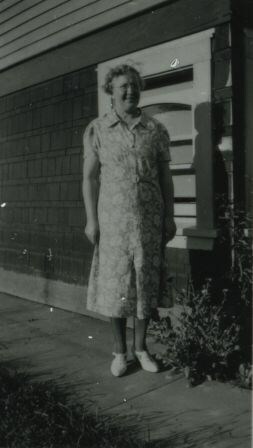 Photograph of Mrs. Ida Le Grove standing outside of 2224 Antrim Avenue (later renumbered 6957 Antrim Avenue). 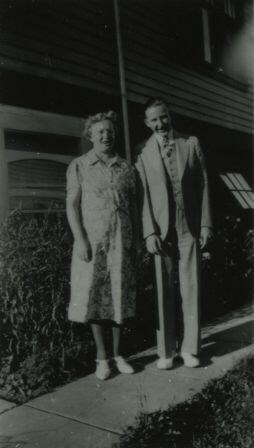 Photograph of Mrs. Ida Le Grove and Lyle Le Grove standing outside of 2224 Antrim Avenue (later renumbered 6957 Antrim Avenue). 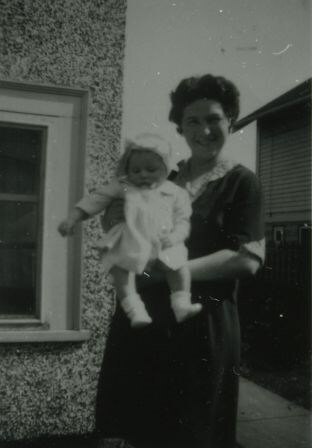 Photograph of Evelyn Le Grove holding baby Anne Le Grove outside of 2224 Antrim Avenue (later renumbered 6957 Antrim Avenue). 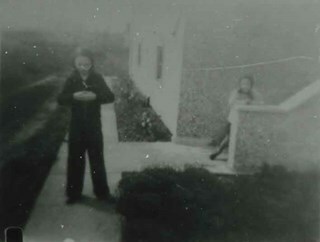 Photograph of (left to right) Evelyn, Anne and Ida Le Grove in the garden at 2224 Antrim Avenue (later renumbered 6957 Antrim Avenue). 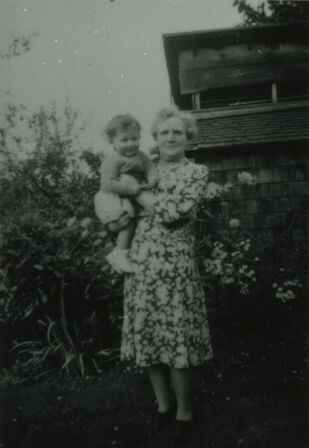 Photograph of Ida Le Grove holding Anne Le Grove in the garden of 2224 Antrim Avenue (later renumbered 6957 Antrim Avenue). 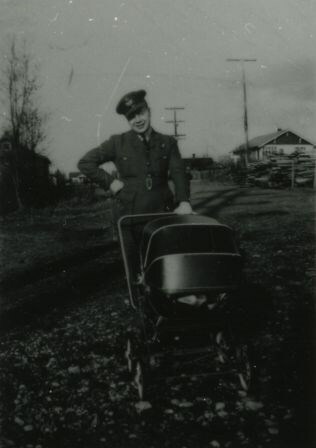 Photograph of a British soldier in uniform at 2224 Antrim Avenue (later renumbered 6957 Antrim Avenue) with a baby carriage. The street can be seen in the background. 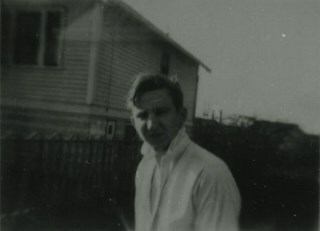 The solider is believed to be Arthur "Tubby" Heath. 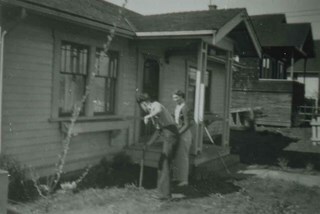 Photograph of (left to right) Jack Cole, baby Anne Le Grove and Ida Le Grove outside of 2224 Antrim Avenue (later renumbered 6957 Antrim Avenue). 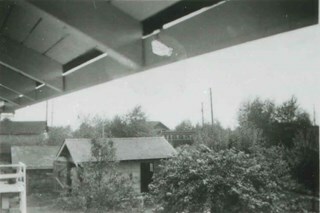 Laundry can be seen on the line in the upper left of the photo. 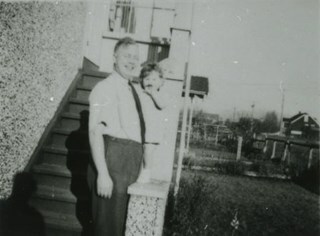 Photograph of (left to right) Arthur "Tubby" Heath and Anne Le Grove standing outside of 2224 Antrim Avenue (later renumbered 6957 Antrim Avenue). 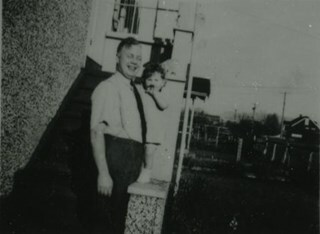 Photograph of Eddie Manning, a British soldier, at 2224 Antrim Avenue (later renumbered 6957 Antrim Avenue) with a baby carriage. The street and houses can be seen in the background. 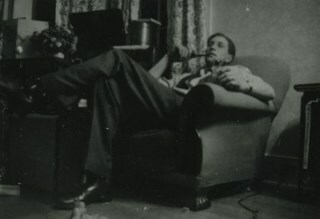 Photograph of Arthur "Tubby" Heath sitting in the living room of the Le Grove house at 2224 Antrim Avenue (later renumbered 6957 Antrim Avenue) on Christmas day. 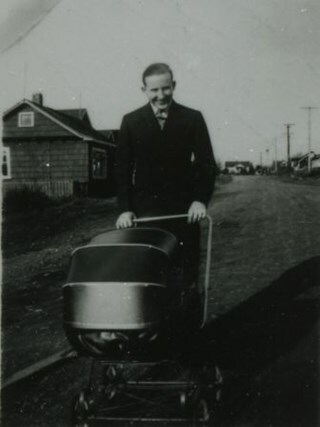 Photograph Lyle Le Grove with a baby carriage, at 2224 Antrim Avenue (later renumbered as 6957 Antrim Avenue). Photograph of Eddie Manning, a British soldier, sitting in the living room of the Le Grove house at 2224 Antrim Avenue (later renumbered 6957 Antrim Avenue) on Christmas Day. 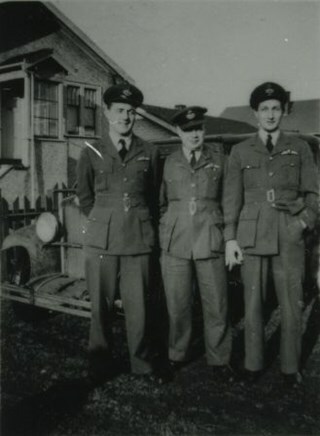 Photograph of Chuck [last name unknown], Arthur "Tubby" Heath and Eddie Manning standing outside of 2224 Antrim Avenue (later renumbered 6957 Antrim Avenue). They are in uniform. 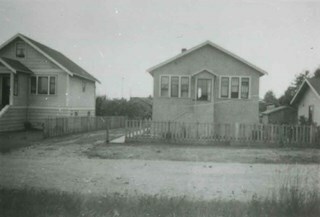 A 1930 Chevrolet and houses can be partially seen behind them. 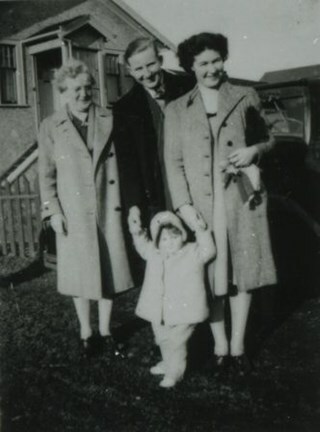 Photograph of (left to right) Ida, Lyle, and Evelyn Le Grove, with baby Anne in front, standing outside of 2224 Antrim Avenue (later renumbered 6957 Antrim Avenue). 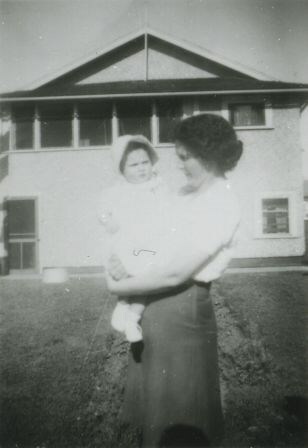 Photograph of Evelyn Le Grove holding baby Anne Le Grove outside 2224 Antrim Avenue (later renumbered 6957 Antrim Avenue). 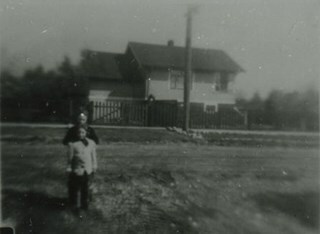 Photograph of Lyle and Evelyn Le Grove and baby Anne standing outside of 2224 Antrim Avenue (later renumbered 6957 Antrim Avenue). 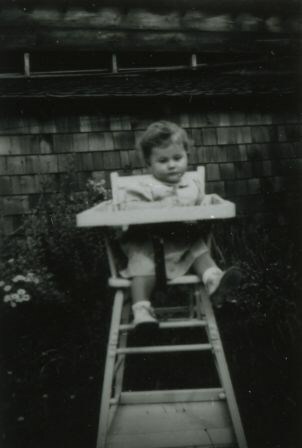 Photograph of Anne Le Grove seated in a highchair outside of 2224 Antrim Avenue (later renumbered as 6957 Antrim Avenue). Photograph of Anne LeGrove seated outside of 2224 Antrim Avenue (later renumbered 6957 Antrim Avenue). 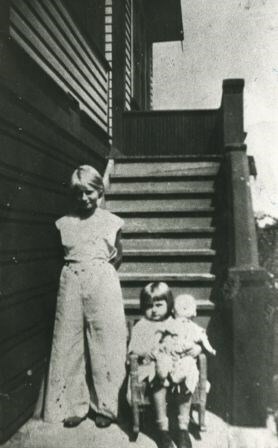 Photograph of children Allan and Frieda Scott standing outside of 2224 Antrim Avenue (later renumbered 6957 Antrim Avenue). 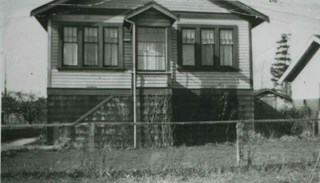 Photograph of the front of the Le Grove family home at 2224 Antrim Avenue (later renumbered 6957 Antrim Avenue). The Williamson family home is to the left. 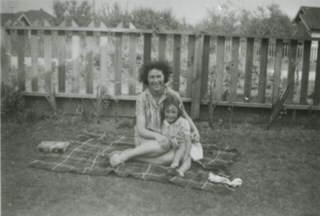 Photograph of Evelyn Le Grove and Frieda Scott seated on a blanket in the yard in front of 2224 Antrim Avenue (later renumbered 6957 Antrim Avenue). 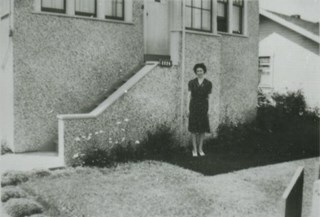 Photograph of Evelyn Le Grove standing in front of 2224 Antrim Avenue (later renumbered 6957 Antrim Avenue). Photograph of the front of the Le Grove family home at 2224 Antrim Avenue (later renumbered 6957 Antrim Avenue). Photograph of a 1934 Chevrolet parked in the driveway of 2224 Antrim Avenue (later renumbered 6957 Antrim Avenue). 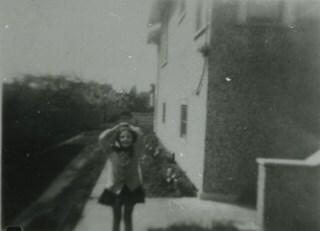 Photograph of Ida Le Grove at the back of 2224 Antrim Avenue (later renumbered 6957 Antrim Avenue). 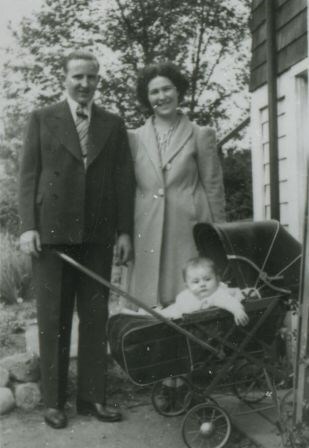 Photograph of (left to right) Evelyn Le Grove, Allan Scott and Ida Le Grove with a 1934 Chevrolet in the driveway of 2224 Antrim Avenue (later renumbered 6957 Antrim Avenue). 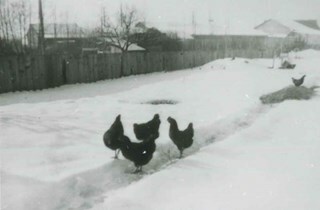 Photograph of chickens in the yard of 2224 Antrim Avenue (later renumbered 6957 Antrim Avenue) in the snow. Photograph taken looking south from the back of 2224 Antrim Avenue (later renumbered 6957 Antrim Avenue). The British Columbia Electric Railway Company tracks and Central Park tram are partially visible in the background. 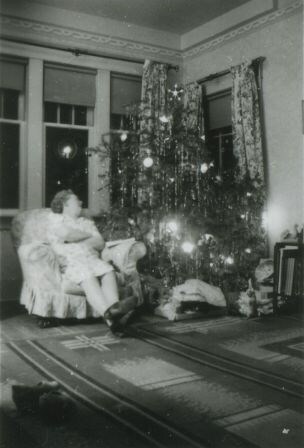 Photograph of Ida Le Grove seated in a chair beside a Christmas tree at 2224 Antrim Avenue (later renumbered 6957 Antrim Avenue). 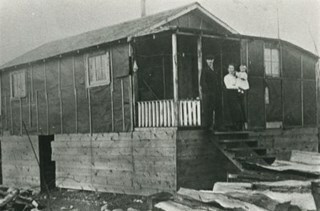 Photograph of the original Williamson shack at 6965 Antrim Avenue. 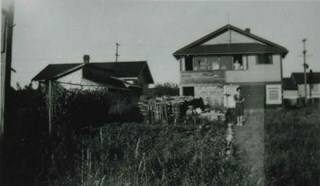 This building later became a chicken house when another family home was built. 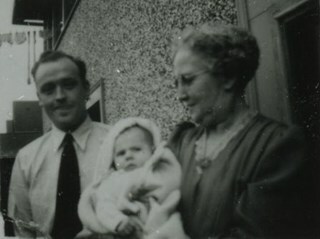 Mr. Williamson is standing with his wife Minnie Williamson (nee Sharples) who is holding their baby daughter, Marjorie. Photograph of the completed Williamson family home at 6965 Antrim Avenue. Pictured (left to right) Marjorie Williamson and Elsie Williamson, daughters of Mr. Williamson and Mrs. Minnie Williamson, who built the home. Photograph of the "Wood" house (the home of the Wood family) on Antrim Ave, next door to LeGrove family home at 2224 Antrim Avenue (later renumbered 6957 Antrim Avenue). Two unidentified people are standing outside.